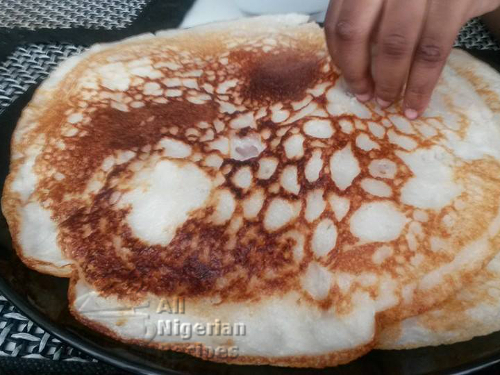 Sinasir is a Northern Nigerian (Hausa) rice recipe fried like pancakes. It is prepared with the soft variety of rice, the type used for Tuwo Shinkafa. Soak the 180g of soft rice for 3 to 4 hours. Boil some rice that will be equivalent to a handful when done. Add the cooked rice to the soaked rice and blend till smooth. Add the yeast and allow to rise. Add the onions, sugar and salt and mix thoroughly. Set a frying pan on the stove, preferably a non-stick frying pan. Pour a small amount of oil into the pan. Once hot, pour some batter into the pan making sure it is thin like pancakes. Fry on medium heat till the top cakes. Flip to fry the other side till golden brown. You may fry only one side if you wish. Tastes delicious either way. Serve with Vegetable Soup, Nigerian Suya, Pepper Soup or eat like that as my toddler does lol.